Gold-tone filigree covers the front of this beautiful hair accessory. 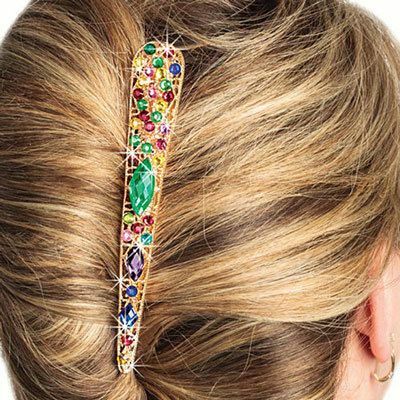 Opulent, crystal accents and a large oval faceted faux gem adorn the front. 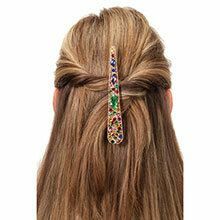 Spring-action, alligator-style Ornate Bejeweled Hairclip is ideal for a variety of twists, half-up styles and more. 5½"l.
This item is even more beautiful in had than in the picture. Everythong about it is simplybrilliant. I've found the perfect gift for all my friends. I've ordered 6 of them so far, and I'm not done yet. Fabulous!